FSA is about Feng Shui, Architecture, Taijiquan and Qigong – my passion, work and play all rolled into one. 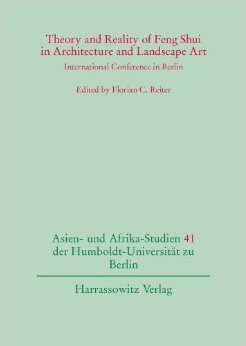 Beginning in 2005, the City University of Hong Kong hosted four international conferences on the subject of fengshui 風水.1 Following the third conference, a volume of proceedings titled, Research in Scientific Feng Shui and the Built Environment, was published.2 For the fifth conference in 2010, the venue moved to Humboldt University in Berlin under the auspices of Professor Florian Reiter, after which a second proceedings volume, titled Feng Shui (Kan Yu) and Architecture, was produced.3 The volume under review is the proceedings of the second Berlin symposium, the sixth in the series, which was held at Humboldt University in 2012. The intention of the Hong Kong conference organizers was to ‘‘bring the study of fengshui beyond the shadow of superstition’’ and to investigate whether it has any scientific foundation. One important aspect of that investigation was to ‘‘filter out’’ the ‘‘imaginative’’ from what was authentic, especially in the ‘‘rules of the Compass School.’’ The methodology of the Form School, on the other hand, was not suspect, since ‘‘a large proportion . . . is actually taught in schools of architecture around the world.’’4 Consequently, of the four parts of that first conference proceedings, only one dealt with the Compass School, and its conclusion was that ‘‘contradiction renders the theory inconsistent and questionable.’’ Furthermore, ‘‘[i]t is important that the practitioners be aware of this in the applications.’’5 This last statement clarifies a subtext that might escape some readers: so-called scientific fengshui is that whose theories are ‘‘logical’’ and have practical applications, and the task of investigation is to show the efficacy behind such practices. The chapter continues with analysis of the ‘‘overall geophysical frame’’ (p. 8), including discussions of traditional Chinese building practices such as symbolic ornamentation, especially in traditional roof design, and its relation to fengshui. Reiter still considers Compass School concepts worthy of study, although when such analysis does appear in this volume, it is usually subordinate to Form School theories. For example, the contributions of the fengshui architect team of Howard Choy and Gyda Anders are essentially case studies of traditional Chinese architecture. In his chapter on the ‘‘Layout of Traditional Shanxi Residential Dwellings,’’ Choy argues that residential siting traditionally began with an objective analysis of the physical site followed by divination, thus combining the use of xingshipai 形勢派 (Form School) and liqipai 理氣派 (Compass School) theories. As he puts it, ‘‘This is to ensure that both the objective and the subjective parts of human needs are taken into consideration, so the outcome is not only practically efficient but ritually correct as well’’ (p. 182). ‘‘The Power of Feng Shui and Amulets,’’ by Klaas Ruitenbeek, is also critical of Compass School theories.8 Ruitenbeek begins his discourse by explaining how the concept of fengshui is essentially simple—‘‘build a beautiful house, or a beautiful tomb, in a pleasant place, with some mountains in the back to protect you, and water in front of the house for a lush feeling’’ (p. 105). However, because ‘‘only if something is difficult, arcane, hard to penetrate, will it be taken seriously,’’ it was eventually made complicated by ‘‘the system of calculations, developed in the early centuries BC, that had as its main components the five elements water, wood, fire, earth, and metal, the ten heavenly stems and twelve earthly branches, the Diagram of the Luo River and the Chart of the Yellow River’’ (p. 106). He then discusses various building rituals of Chinese carpenters and concludes that fengshui ‘‘can be regarded as a kind of imaginary architecture, which is superimposed on the actual architecture of bricks, beams and tiles’’ (p. 112). Of the remaining chapters, one is notable for its conservative view that the fengshui of architecture is meaningless outside the religious context of ancestor worship. Huang Lan-shiang, in ‘‘The Application and Extension of Clan-Ethical Feng Shui Belief on Hakka Residential Building,’’ analyzes tomb and residential architecture of Hakka minority communities in Taiwan, Fujian, and Guangdong and concludes that: ‘‘There is a straight spiritual connection between the graveyard and the . . . residential facility that in its central building harbours the house altar with the spirit seat of the ancestors’’ (p. 49). Much of his richly illustrated analysis points out the remarkable resemblance of the structure of the sanheyuan 三合院 housing compound and the traditional tomb configuration. Huang’s chapter is in Chinese, which will make it inaccessible to some readers. Ellen Van Goethem’s ‘‘Feng Shui Symbolism in Japan’’ deals exclusively with the transmission of the Chinese concept of the Four Divine Beasts 四聖獸 to Japan and its eventual assimilation into Japanese cultural norms. These figures originated as zodiacal constellations in ancient Chinese cosmology and became symbols of the cardinal directions in Form School fengshui. Tsai Sueyling’s ‘‘Feng Shui of the Reclining Buddha’’ gives a fengshui reading of the physical configuration of a monastic site, Wofoyuan 臥佛院, in Sichuan, picturing the Buddha there to be ‘‘imbedded in the womb of the dragon’’ (p. 81). While she admits there is ‘‘no evidence to demonstrate that the planners of this Buddhist site were conscious of this fengshui reading,’’ Tsai locates a colophon attached to the site in the tenth century by an ‘‘expert of the Geomancy of the Five Tunes (wuyin dili 五音地理)’’ (p. 83), a branch of the Compass School. For readers of this review it may seem quaint that scholars appear to claim some fengshui methodologies are efficacious while others are not. I will simply echo another reviewer trying to make sense of scientific fengshui who said, ‘‘perhaps we should keep our minds open on this score.’’10 The importance of fengshui in the history of Chinese naturalistic thought is unquestionable, and the scholarly world is therefore greatly enriched by the efforts of Florian Reiter to make such studies available. 1 In this review, the convention of linking pinyin syllables that form words will be followed. Thus, the word 風水 will be rendered as fengshui, unless it is spelled otherwise in a published chapter or book title. 2 Michael Y. Mak and Albert T. So, eds., Research in Scientific Feng Shui and the Built Environment (Hong Kong: City University of Hong Kong Press, 2009). 3 Florian C. Reiter, ed., Feng Shui (Kan Yu) and Architecture: International Conference in Berlin (Wiesbaden: Harrassowitz, 2010). 4 Mak and So, Research in Scientific Feng Shui and the Built Environment, xvii. 6 Reiter, Feng Shui (Kan Yu) and Architecture, vii. 7 The former chapter, ‘‘The Origin of Bazhai fengshui,’’ is attributed to the joint authors, Stephen Field, J.K. and Ingrid Lee. However, the latter two names were inadvertently copied by the editorial staff from Field’s academic title (‘‘J.K. and Ingrid Lee Professor of Chinese, Trinity University’’). 8 Ruitenbeek is perhaps best known as the translator of the Ming dynasty Lu Ban jing 魯班經. See his Carpentry and Building in Late Imperial China: A Study of the Fifteenth-Century Carpenter’s Manual Lu Ban jing (Leiden: Brill, 1993). 9 Mak and So, Research in Scientific Feng Shui and the Built Environment, 209-30. Architecture, in Journal of Chinese Religions 41, no.1 (2013): 79.